The street lights seem to glow against the stone walls of the Seville Cathedral at dusk as night falls in the historic town in Andalusia, Spain. A peaceful way to end the day, relaxing in the plaza virgen de los Reyes near the historic Seville Cathedral. The glow of the street lights highlight the cathedral at dusk. 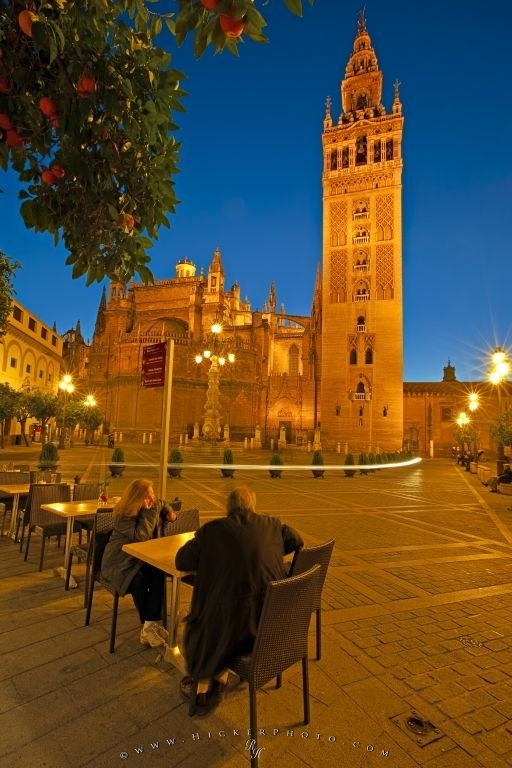 Seville Cathedral and La Giralda (bell tower/minaret) , a UNESCO World Heritage Site, seen from the Plaza Virgen de los Reyes at dusk, Santa Cruz District, City of Sevilla (Seville), Province of Sevilla, Andalusia (Andalucia), Spain, Europe. Photo of the Seville Cathedral at Dusk in the city of Seville, Andalusia, Spain, Europe. Pictures from photo gallery "Seville City Pictures"
This picture is part of the photo album "Seville City Pictures" - there are more beautiful images waiting for you.